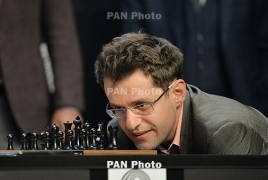 PanARMENIAN.Net - After a wild day at the 2018 Sinquefield Cup in which the gamesmanship didn't even end on the final move, Armenian grandmaster Levon Aronian, Magnus Carlsen of Norway, and Fabiano Caruana of the United States are all co-champions, Chess.com reports. That's the one thing they can agree on. After Aronian defeated Alexander Grischuk via a speculative but dynamic exchange sac, several hours later Carlsen outmaneuvered Hikaru Nakamura in an ending that had happened before. With Caruana drawing as black with ease against Wesley So, that left the three past winners all sitting on 5.5/9. They would all get the same Grand Chess Tour points (a moot issue for the wildcard Carlsen), and all split the money evenly. As for the trophy and the title, the regulations stated that tiebreaks would determine the top two, with the third player left out. That was the crux of the problem -- all three had the same mutual record (all draws vs. one another), the same number of wins (two), and the same number of wins as black (zero). As per rule 2.1.4, the fourth tiebreak was a drawing of lots, meaning complete chance. Neither Carlsen nor Aronian liked that option (Carlsen and Aronian both also pointed out that the same language was used last year, and neither one liked it then). Carlsen and Aronian both preferred a three-man playoff. But Caruana, who was not present, had already declined that option. GCT staff told the players that only in the case of unanimity could the rules be changed. Short of that alteration, Carlsen and Aronian agreed the next best option would be no playoff at all and a shared title. Caruana agreed, and a consensus was reached. Japan, EU reiterate support for Iran nuclear deal Despite U.S. sanctions and opposition, Japan and the European Union have reiterated support for Iran nuclear deal. New mobile game can detect Alzheimer's risk Tn app called Sea Hero Quest has been downloaded and played by more than 4.3 million people worldwide. Depression treatment regimens for some: study A study identifies 2 potential medication tweaks for certain subgroups of patients with treatment-resistant major depressive disorder.